Before I start, there is something I forgot to mention in my Day 2 report that is relevant to this day and I forgot to mention until now: So not too long after putting on my Reimu nail polish on day 2, I realized: I forgot to bring nail polish remover. Which meant I'd have to be stuck with red nails on day 3 as well unless I could find someone with polish remover. Long story short two friends had friends with remover, and as for how that turned out, keep reading. I put on my Yukki cosplay, ran through the room to make sure all of my stuff is on me, and bid farewell to our room. Met up with a friend of mine, who unfortuantely informed me that her friend left early. As for my other friend, he never got back to me. Fortunately nobody throughout the day really noticed I had nail polish on. The final autograph session was at 12 PM so I lined up around 11:30 AM, and passed the time by reading SCP pages on my phone. The autograph area was in a large exhibit hall this time, which certainly helps facilitate long lines and keeps them from crowding up the hallways of the convention center. Fortunately, that element wouldn't be necessary, as it took all of 10-15 minutes for me to get to Mai Aizawa's booth. I met Ms. Aizawa, known for roles such as Uryuu Minene from Future Diary / Mirai Nikki and Mio Naganohara from Nichijou, and she was as adorable and friendly as ever. 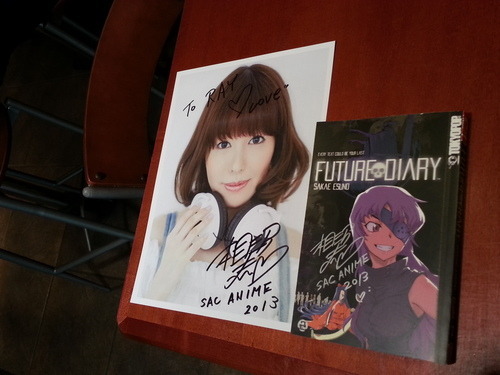 I had her sign my copy of Future Diary vol. 2, as well as a portrait of her that was being sold for $10. She told me she remembered me from Fanime and shook my hand, which pleasantly surprised me :O My objective done, I headed out. I wanted to catch Cafe Hoshi since I missed them last time, but they were sold out of tickets. Welp. Instead I went to the gaming room, mostly to play a few rounds of IIDX and Batsugun. 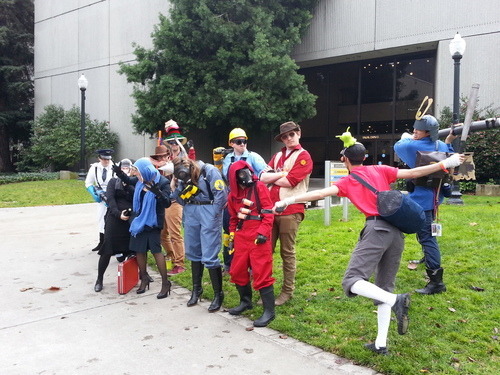 Sometime afterwards, the Valve gathering was taking place, so I decided to check that out. 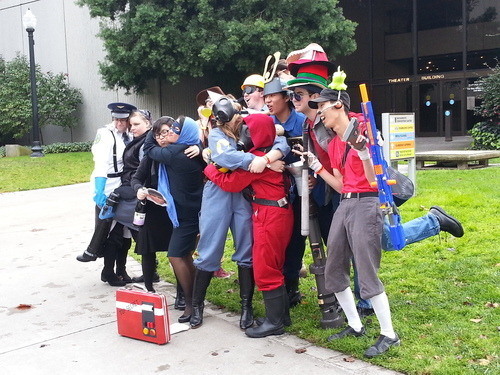 As always, most of the cosplayers there were TF2 cosplayers. 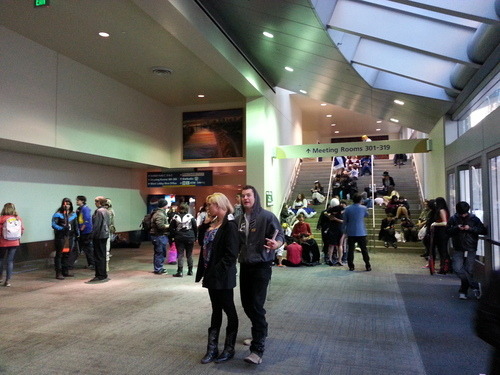 Afterwards, I met up with a good friend of mine and we mostly walked around the convention center. 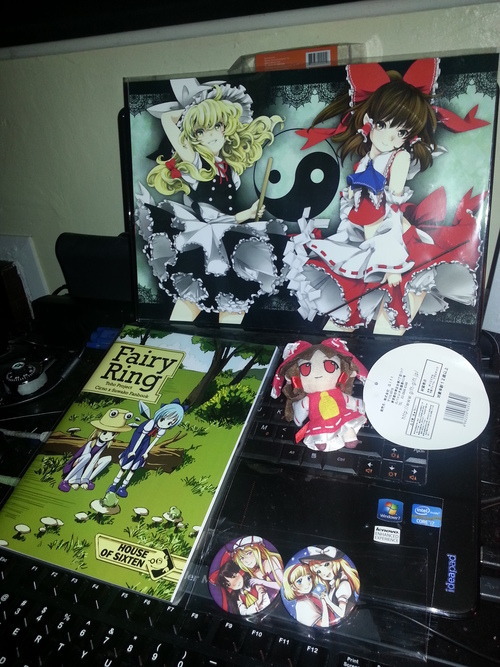 I finally decided to get a few wares: A minature Reimu plushie, a Cirno/Suwako doujin by House of Sixten, a print of Reimu and Marisa, and a couple shipping buttons by magical-ondine. Surprisingly, the vendor's hall was open until 6 PM, which is pretty late by the standards of convention last days. I didn't stick around for that long though. I wanted to go home at some point, and also my parking pass was only good until 6 PM, so I gathered my carpool around 4:45 PM and departed the convention. I dropped everyone off, then fell asleep not too long afterwards, glad to be back on a bed. The convention's move to the Sacramento Convention Center opens up many new possibilities--much larger convention space, more variety of hotels, and more capacity to grow. It does however, come with a few drawbacks, like now having to pay for parking, and its location in downtown Sacramento can make some congoers uneasy, especially after hours. My own experiences weren't really much to write home about. I missed the Touhou gathering due to awkward scheduling, I couldn't go into the gaming room for long and even then selection of games I enjoy was much smaller this time, and I hardly found anything to do, especially on Saturday. (Running on 5 hours of sleep per night didn't help matters.) I did however make a new friend here, something that doesn't happen at cons to me a lot these days, and I also got to meet and shake hands with a seiyuu for the first time. Hopefully things iron out for Sac Summer and I can have a better experience. Maybe then we'll see more of the con space used as well. 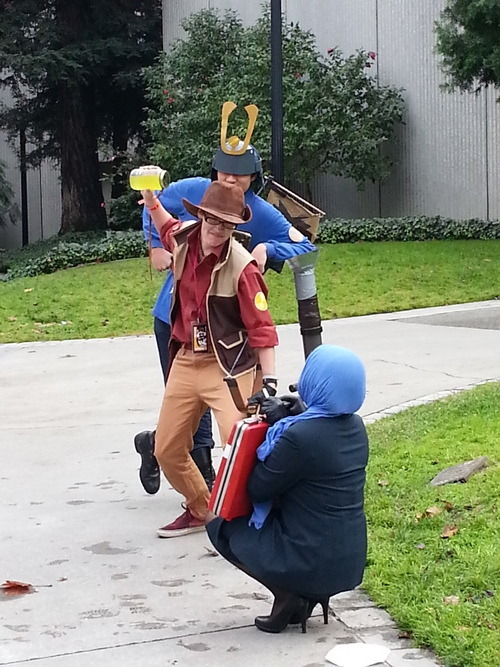 At 7,500 estimated attendees, Sac-Anime is shaping up to be a biyearly "light" version of Fanime. While it won't necessarily rival Fanime anytime soon, I can see this con continuing to rake it plenty of successes, both on its end and mine. For now, it's time to focus on my next convention: Animation on Display next month, in Japantown, San Francisco. One of the more fun cons, if only because there is the entire Japantown shopping plaza to play around with, AND there is the little arcade full of rhythm games to enjoy myself at. Its smaller size also makes it one of the more "communal" conventions, in contrast to larger, event-oriented cons like Fanime. I might also attend Real Escape Room, or as I like to call it, a real-life "escape the room" game (think MOTAS or Crimson Room but in person rather than a Flash game). While not part of AoD, it just happens to be going on in the same area that weekend as part of its weekly schedule. I may cover this a little bit if I attend (though don't worry, I won't spoil anything for you ~_^). Until next con, this is Ray, signing out.